What started in 2009 as a passionate team of 3 in Elmira, has rapidly grown into the Timber Barn showroom in the heart of St. Jacobs. Today, we have become one of the most sought-after custom woodworking companies in the Kitchener-Waterloo region attracting clients across the province. We offer everything from handcrafted cabinetry and reclaimed furniture, to beams, timber frames and front entrances. We strive to stand out with innovative designs and execute with an obsession to detail. To do this, we have partnered with local Mennonites and Amish businesses to supply quality timber and community craftsmen to finish the job. Every piece that goes through our shop is handled with a level of pride that shines through in our products. We are passionate about great design, encourage our clients to go against the grain, and fuel their unique ideas with our experienced team of designers, engineers, craftsmen and installers to provide a quality product that stands the test of time. There is no question that if given the opportunity, the entire Timber Barn team will put forth their absolute best efforts to ensure the entire project surpasses your expectations from initial concept, to production, and through to final install. Millbank Family Furniture is a family owned business located in the quaint village of Millbank. We specialize in all types of furniture, custom kitchens, bathrooms, laundries & more, which are all locally handcrafted from solid wood. Here at Millbank Family Furniture we are committed to offering you the best shopping experience as well as top quality delivery & product. We take care in every step of the process to insure the furniture pieces or cabinets that you receive are built, finished & installed with the highest standards. The hardwoods we use are sourced from environmentally conscious suppliers and Canadian plywood instead of plywood imported from China, which have high concentrations of formaldehyde and other respiratory damaging chemicals. Lastly, we finish all of the products we sell with the top quality stains, paints & post catalyzed lacquers so you can enjoy the beauty of your furniture & cabinets for many years. We would love the chance to work closely with you to make all your dream pieces a reality. The roots of Sutcliffe Kitchens and Renovations run deep in the Guelph area. After opening a showroom in 2008 Sutcliffe Kitchens began designing and producing stunning projects. Staffed with a team of talented kitchen designers and experienced renovation experts we take your vision and make it a reality. Owner, Kevin Morrell, has a vast knowledge of carpentry. After many years in the woodworking and cabinetry industries Kevin has developed a fine eye for detail. With his experience and knowledge Kevin is able to guide the Sutcliffe team through your project. Countryline Woodcraft designs kitchens, offices, libraries, furniture and more. Solid wood and traditional carpentry gives you quality results that will last for generations. We work with you, and for you to deliver the product and design that you want and deserve. 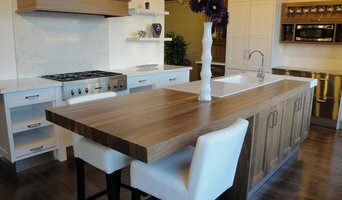 Since 1983, we have built and delivered fine solid wood furniture, kitchen cabinets and re-facing. 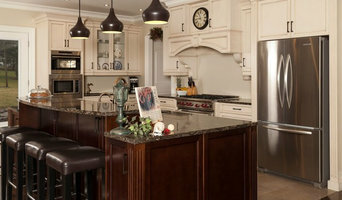 More recently, more of our clients have asked us to apply our craftsmanship to kitchens, libraries and other build-ins. Our commitment to traditional carpentry methods and use of solid wood and plywood (rather than particle board) is important to us as well as our clients. Browse our website to see examples of our work, or give us a call for your customized designs. It would be our pleasure to work with you to design and build the quality result you are looking for. NKBA certified designer Debbie Hammer has been designing beautiful kitchens and bathrooms since 1989. 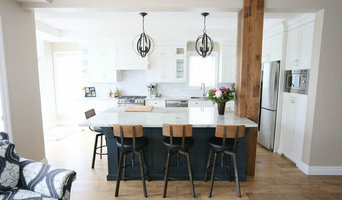 She specializes in designing the perfect space to fit any style or budget. Debbie’s ability to collaborate with clients, contractors, and vendors helps to create a seamless project. What does a Guelph kitchen designer or bathroom designer do? A kitchen and bath design professional in Guelph, ON knows to take all of these crucial points into consideration and can help plan the layout, materials and overall look and feel of either of these rooms in your home. Kitchen designers, as well as bathroom designers, are constantly staying on top of trends in the ever-changing industry. The designer also knows the best layout for your room, and can configure the layout for optimal functionality and utilization of the space. In the kitchen the refrigerator, stove and sink should be laid out in relation to one another, and it should be seamless and easy to move from one to the other. A Guelph kitchen and bath designer will know how to work with a contractor and architect to plan the flow of the room to work best for your needs. Here are some related professionals and vendors to complement the work of kitchen & bath designers: Kitchen & Bath Fixtures, Appliances, Tile, Stone & Countertops, Cabinets & Cabinetry, Woodworkers & Carpenters. Before you talk to bath and kitchen designers in Guelph, ON, consider how you will use the room. For your bathroom, is it necessary to have a bathtub for bathing kids or pets, or would a shower suffice? Perhaps all you need is a half bath for downstairs or a smaller guest bath for occasional use. Similarly, for kitchen renovations consider your cooking habits. Do you eat out every night but need a space to entertain in? If so, a smaller kitchen might be fine for you, with a space devoted to wine storage or a bar, whereas others might prefer a bigger stove or extra cabinets. When interviewing Guelph kitchen and bath designers, make sure to share these habits so they can best fit the room to suit your needs. Find a Guelph kitchen designer or bathroom designer on Houzz. Narrow your search in the Professionals section of the website to Guelph, ON kitchen and bath designers. You can also look through photos in Guelph, ON to find a kitchen or bathroom you like, then contact the professional who designed it.